What is my Wireless Security Key? Did Santa bring you a new Kindle Fire, iPad Mini, or Microsoft Surface for Christmas? If so, probably one of the first things you wanted to do was connect to your home wireless network. To connect, you'll be asked for a "key", which is a code that lets you in (and keeps others out). The common dilemma is that users have set up a wireless network a LONG time ago, recorded the key, and stored it in a "safe place", only to be stumped when you look for it again. The problem is that after you program the key into your laptop or other portable devices, your system "remembers" it, so you end up forgetting. Don't worry! They key is easy to retrieve. If you have a laptop connected to your wireless network, select the wireless icon in the lower right hand portion of the screen. "Left click" on your mouse to view the wireless networks. (Right-clicking allows you to "troubleshoot problems" and "Open Network and Sharing Center"). After you select the wireless networks icon, you'll see a list of all the wireless networks nearby, including the one you are connected to (in this case, the list is blanked out for privacy and only the first one is showing.) 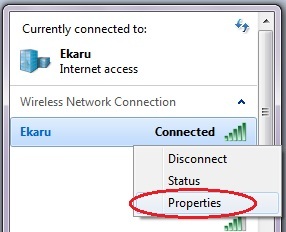 "Right Click" on your network and select "Properties" to view the properties of your network, including the wireless key. 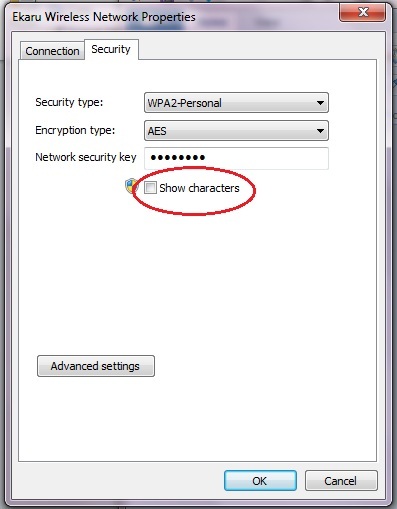 In the "Properties" window, under the "Security" tab, you'll see the "Network Security Key" listed, with characters hidden. To see the actual key, check the box to "show characters", and you'll have your key! So if the encryption key that you wrote down two years ago is in a "safe place" somewhere, rest-assured you'll also find it stored electronically here. No need to rummage through all your files!